Now in its third iteration (with Halo and Halo 2 setting the precedent), the Halo iQ provides wearers with incredible sound quality and reliable smartphone compatibility. Through the TruLink app, the Halo is designed to connect to the iPhone, iPod touch, Apple Watch, and other Apple devices. The Z Series is a line of wireless hearing aids with a new operating system, BluWave 4.0, which gives wearers an enhanced, natural, high-quality sound. The Z Series also offers features such as Binaural Spatial Mapping and Acuity Directionality, which provide wearers with a full spectrum of sound, filtering out unwanted noise and situating them within their environments. VoiceIQ and Speech ID both assist wearers with speech recognition, especially in noisy spaces such as busy restaurants. Starkey has also equipped the Z Series with a Self Learning feature, in which the operating system memorizes wearer preferences and makes automatic adjustments. The Z Series connects to personal electronic devices with the SurfLink Mobile, Media, and Remote apps, boasts a long battery life, and is coated in Hydrashield2, which protects the hearing aid from dust, water, and oils. Starkey offers a large collection of hearing aid styles and features, which are fully customizable to wearer preference. Starkey hearing aids are available in the following models: invisible, receiver-in-canal, completely-in-canal, behind-the-ear, in-the-canal, and in-the-ear. The Multiflex Tinnitus Technology is available in the micro receiver-in-canal model of the Z Series. There is also a tinnitus-specific hearing aid designed to deliver relief from ringing in the ears. As for the Halo, it is available in receiver-in-canal and behind-the-ear styles. Starkey also has a line of hearing amplifiers, which can be worn invisibly in the ear and is designed for first-time hearing aid wearers. Starkey offers special benefits with certain hearing aid technologies and styles for veterans as well. 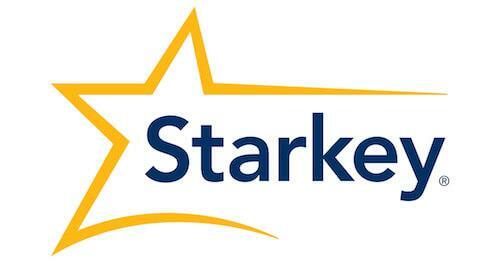 Interested in Starkey hearing aids?